For half a century, Ella Howard Bryan wrote poems, short stories, and novels under the name Clinton Dangerfield. The list of magazines that published her work is long and impressive, ranging from the high-class (The Century, The Smart Set), through the popular (The Saturday Evening Post, Liberty), to the lowly pulp (Rodeo Romances, Ace-High). She was born in Savannah, Georgia, on February 19, 1872, to Major Henry Bryan and Jane Howard Bryan. Her father earned his rank with the Confederate Army during the Civil War. Born midway between the end of the war and the end of Reconstruction, Ella would no doubt have grown up in an atmosphere dripping with memories of the recent conflict and the antebellum period. The milieu of the Confederacy would show up later in her poetry and fiction, including a movie short based on her work. Ella was educated at home and spent her childhood on her mother's homeplace on Lookout Mountain, Tennessee. She served as a governess in the North from 1897 until 1901 when she published her first story, "Behind the Veil." The story proved such a success that Ella returned to her home and assumed a new career as a writer and the nom de plume Clinton Dangerfield. Her choice of a manly-sounding pseudonym would prove propitious in her career as a pulp fictioneer. Although she started her writing career with stories and verse submitted to Pearson's, Ainslee's, Watson's, and other popular magazines, she took full advantage of the boom in pulp fiction after World War I. Westerns were a specialty, and she counted The Masked Rider Western Magazine and Buck Jones Western Stories among her many markets. 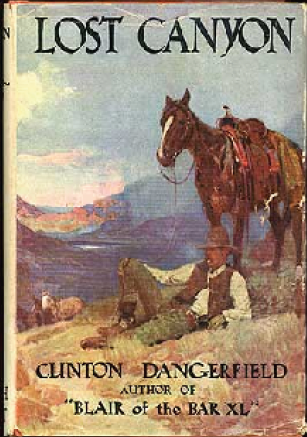 Clinton Dangerfield also wrote novels, including The Rustlers of the Hidden Valley (1932) and Lost Canyon (1932). Two of her stories made it to the silver screen, both short subjects from 1915: "Tides That Meet" and the Civil War story "Vain Justice." Clinton Dangerfield wrote just one story for Weird Tales. It was called "The Message" and it appeared in the September 1931 issue. Ella Howard Bryan, aka Clinton Dangerfield, lived a long life and enjoyed a long career as a writer. Her connections to the South held to the very end, for she died in Richmond, Virginia, capital of the Confederacy, on February 13, 1954. She was just six days away from her eighty-second birthday. Much of Clinton Dangerfield's work is old enough to have fallen into the public domain and has been digitized on Google Books. Her pulp fiction is harder to find however. If anyone knows of any reprints, please let me know, too. 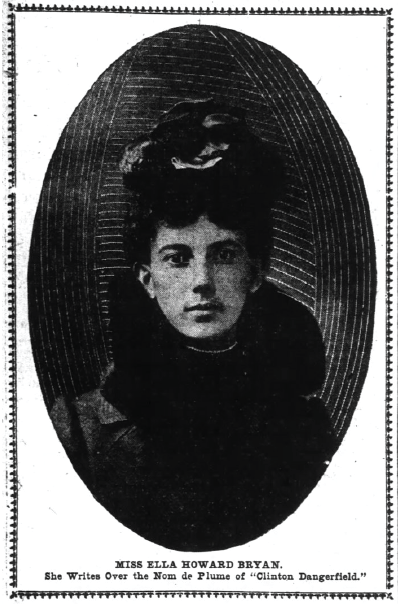 Ella Howard Bryan, aka Clinton Dangerfield, in a photograph from the Atlanta Constitution, 1902. A poor reproduction of the cover of Clinton Dangerfield's western novel, Lost Canyon (1932). Pulp magazines were not only an American phenomenon--Europeans and Latin Americans loved them, too. 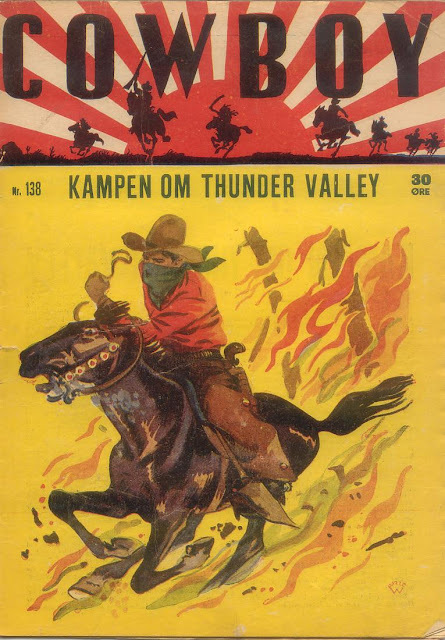 Here's a Danish magazine, Cowboy, from January 1944. Inside is a story by Clinton Dangerfield, "Sort Torden," or "Black Thunder."